While walking to Covent Garden after depositing our bags at the hotel, I spy a well-dressed man at a sidewalk table eating what looks like a mighty fine pizza. Italian style. Topped with prosciutto and fresh mozzarella. This is certainly a revelation to someone who has long considered the phrase ‘good British pizza’ to be an oxymoron. 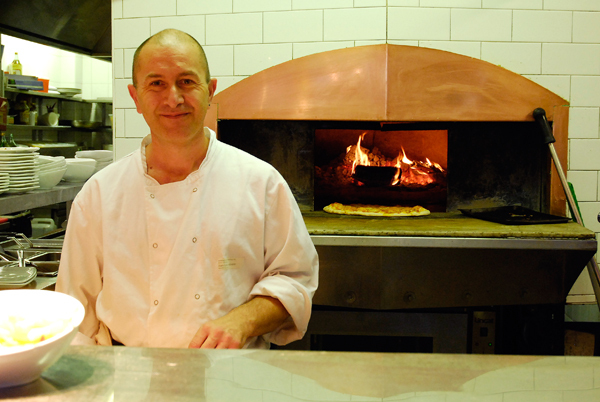 Later, while the rest of the family sleeps off jet lag, I check out the restaurant – Strada by name – and find that right smack dab in the middle of London they’re turning out pizzas from a woodburning oven. The staff is international: a young Italian woman greets me, an overbearing Asian woman runs the dining room, and the cook who poses dubiously for my photo is Eastern European. Outside, a German who has some clout in the kitchen tells me between drags on his cigarette that Strada has 27 locations in the London area and that last year they hired an Italian chef to get the dough right. We return at 8 for a very nice meal indeed. Two perfectly baked pizzas, rigatoni and – for my wife the Salad Queen – squid-ink pasta with sautéed fresh veggies. The pizza crust is light and airy with a delicate crispiness. The toppings are good quality: Italian prosciutto, buffalo mozzarella, sweet tomatoes; the whole is tinged lightly with smoky flavor. The pastas are tasty and cooked ‘al dente’. The only drawback at all is somewhat erratic service from the large waitstaff, which can be excused in light of very reasonable prices for a Central London location. I do worry about that squid ink, though. Is it vegetarian? Out with the cousins at Harrods. As usual, everything here is over the top – a rocking horse for $8,000 and designer Halloween costumes for your pet at around $500 a pop (or is that a pup?). What I love best at Harrods are the food halls, which are the ultimate in foodie paradise and never fail to amaze me. Cheeses, vegetables, charcuterie, meats and seafood, along with sweets beyond your wildest imagination. And there’s a bar for pizza. 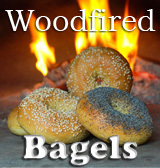 Woodfired, of course. But Harrods doesn’t have just one oven; they have two! For the exorbitant price of a pizza, however, I can only ogle. Now, maybe if I could control just one little oil well…. At Zizzi, a stone’s throw from the train station near Henry VIII’s impressive palace. Gordo, from Morocco’s Atlas Mountains, adjusts the window behind our table at the end of the large dining room to make Granny happy. The Thames River flows quietly beyond. 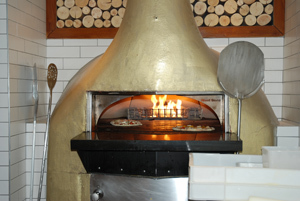 This Zizzi, part of a chain of Italian restaurants that boasts 100 locations around England, is focused around an impressive gas-fired oven (note: the Woodstone oven in the photo is from a different location). The restaurant is half filled with families chortling over pizza. I sense very quickly that Zizzi is like a mediocre version of Strada. The risotto is certainly green, as advertised, but is watery and bland. The pizza crust is good at the edge but undercooked at the center (there’s a cold spot under the ‘ham’). The pizza toppings are decidedly downmarket: canned artichoke hearts and cheap cheese. At the center of the pizza is a large rectangle of what I’m pretty sure is called ‘ham loaf’ at the deli counter. The ultimate insult: this one costs more than the pizza I enjoyed at Strada the other night! I want to like Zizzi, so sleekly European in style, but it falls short on quality. With such a great oven, surely they can do better than this. It’s the Bullhogs turn to feed the troops. My son and I go off to the local Tesco to see what’s on offer, and come back with an armload of pizzas from a popular new rack that sells ‘take and bake’ pizzas. In the great spirit of British supermarkets, they’re very reasonably priced. We remove the plastic, set racks toward the center, and turn out 2 pizzas at a time in the English convection oven (yes, it’s one of those whose fan is always on). 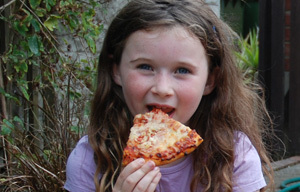 There’s nothing special about the bready crust, but the pizzas sport kid-friendly toppings just fine for a large group. Our hungry crowd is happily eating within a half hour. Even with two frozen cheesecakes and some red wine thrown in, the total bill to feed 14 people comes to under $40. Now how cool is that? 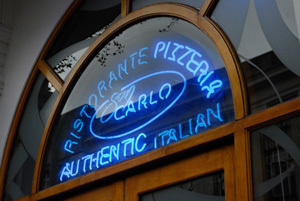 Mauro is grinning from ear to ear from behind the counter at the San Carlo restaurant on Granby Street when I walk in – this time with camera in hand. (I’d come across this restaurant the evening before while seeking Indian food, for which this city is well known.) It amazes me how a woodfired oven can bring people together. Although the jacketed host is unsure of my motives, I wangle my way past to watch Mauro and his crew in action. 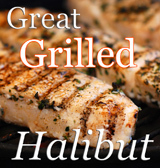 While he checks every dish that goes out – cold salmon, salads, and a beautifully arranged Coquille St. Jacques – Mauro talks easily. Very pleased he is with the pizzas, and shows them off with pride. Because of family commitments I don’t get a chance to try what looks like very tasty pizza. On leaving, Mauro shakes my hand and smiles warmly. I’m pleased to conclude that British pizza has come a long way since the 80’s, when every pizza I dined on had the consistency of cardboard. 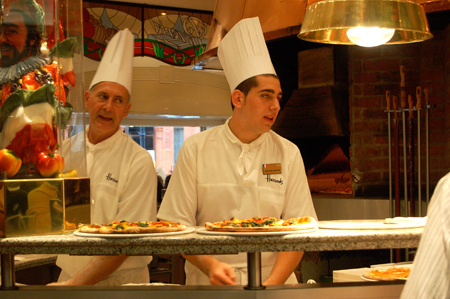 Not only can you now find some very nice pizza, but as in Italy and the U.S. the culture of pizza has taken hold. I found the expectation for quality by young people to be particularly high. I intended to include Edinburgh in this, but by the time we got to our little apartment in Haymarket, we were all tired of eating out and wanted what my kids referred to as ‘real’ food. If you happen to be in Edinburgh, I understand that La Favorita restaurant and La Favorita’s mobile van do a pretty good woodfired pizza. Also, in fairness to Zizzi, I’d be willing to give it another try as I based my opinion on only one visit and one pizza. The atmosphere was pleasant and the crust was fine. Meanwhile, if you’re ever in Leicester, check out San Carlo restaurant on Granby Street, where Mauro will be happy to see you. Be sure to tell him Sortachef sent you, and pass along this message: Flame on! What a wonderful trip and write up. Glad to read that the British have improved their pizza making. I like that Strada had to hire an Italian chef to get the dough right. Wonderful piece. We’ll be in London in November and will check out Strada for sure! I remember when pizza in Britain consisted of dough, tomatoes, chunks of pineapple, pieces of ham and corn kernels. Looks like there’s progress in the UK! Simply fabulous. I’m longing to visit the UK again. 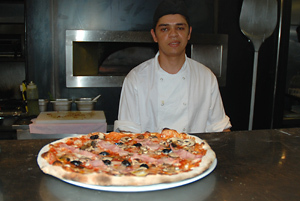 I’ve had so many great pizza experiences while in London. Hi Don, love the pizza tour! I need to get me a wood fired oven. I admire the one you built so much, still need to scope out a place in the back yard for the footprint! Your title grabbed my attention—British and pizza did not belong in the same sentence! So glad you set the record straight with this great piece of pizza sleuthing. Now I know my picky 8 yr. old will be always have something to eat when we make it to England. I’ve never been to Britain, but do love woodfired pizzas. Does that count for something? Fabulous post! With the proximity and accessibility of hundreds of the world’s best cheeses and charcuterie, it’s about time! Love the title of your post.